Welcome! I am so happy you stopped by to see what the Stamp Review Crew has whipped up for you this time! 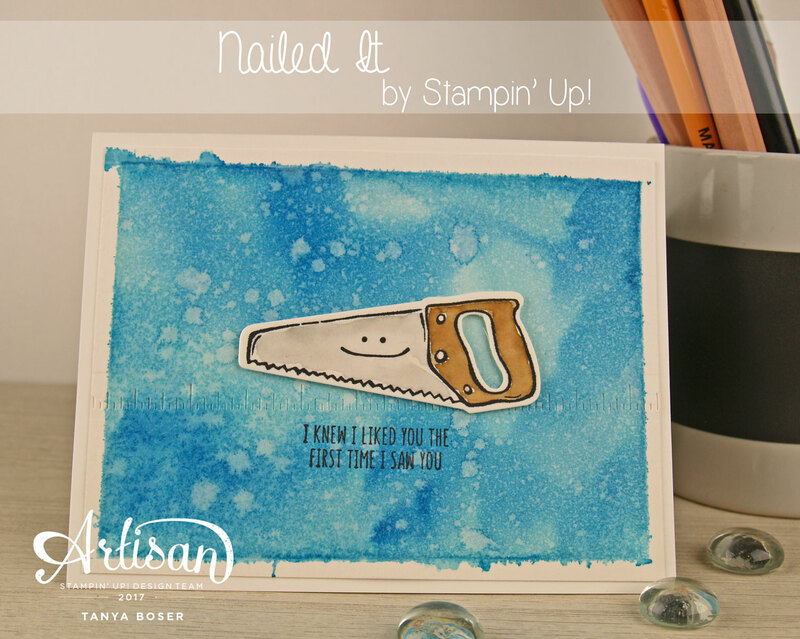 We are using the Nailed It stamp set this time, and boy is it fun to play with! So whimsical and easy to create with. My family is very DIY, and my dad is a contractor, so this set is just perfect for creating stuff for all kinds of people. 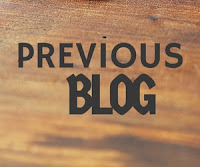 If you are following along in order, then you have just arrived from Australia and the talented Kelly Kent's blog, 😊 I just love her! This is another set that I had purchased at the beginning of the Occasions Mini season because I always want the masculine sets, but I had not had a chance to ink it up until this week. I do love it, and I am so glad I got it before it was all retired. This is a stand-by favorite thing for me to do with just about any set. Embossing in Copper, or white for that matter, is always stunning on Kraft cardstock. That is retiring to by the way. To get it in the Annual catalog, you will have to get the Foil Frenzy DSP, which is gorgeous!! I made a mat that is just 3/8" bigger than the Kraft panel for just a hint of color behind it in Early Espresso. 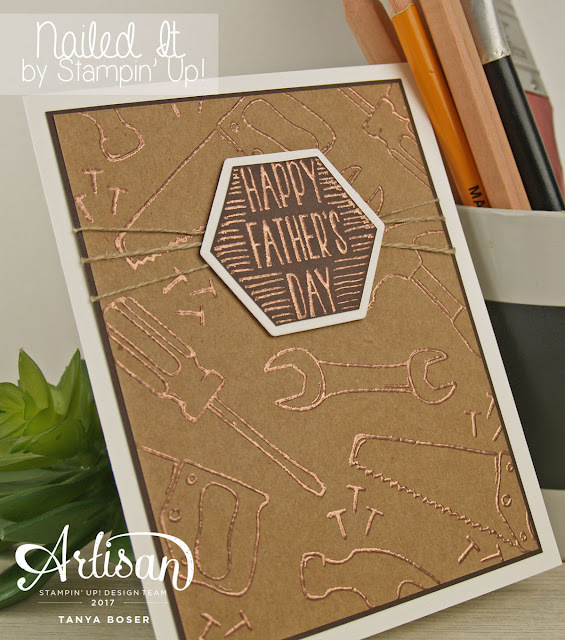 The sentiment is Copper heat embossed on Early Espresso, fussy cut, then adhered to a Thick Whisper White hexagon cut with the die from the Build It framelits. Wind some linen thread around the Kraft/Early Espresso panel, secure with tape on the back, then adhere to a Thick Whisper White card base. Pop the sentiment up with a dimensional. Inside, add a few of the nails image in Sahara Sand stamped off once, and the rest of the sentiment in Early Espresso. All done! This sentiment works for so much more than Father's Day. I was actually quite tempted to put a "Mother's" over the "Father's", as I know a lot of moms that are the handy one in the family, lol. Look at that detail! 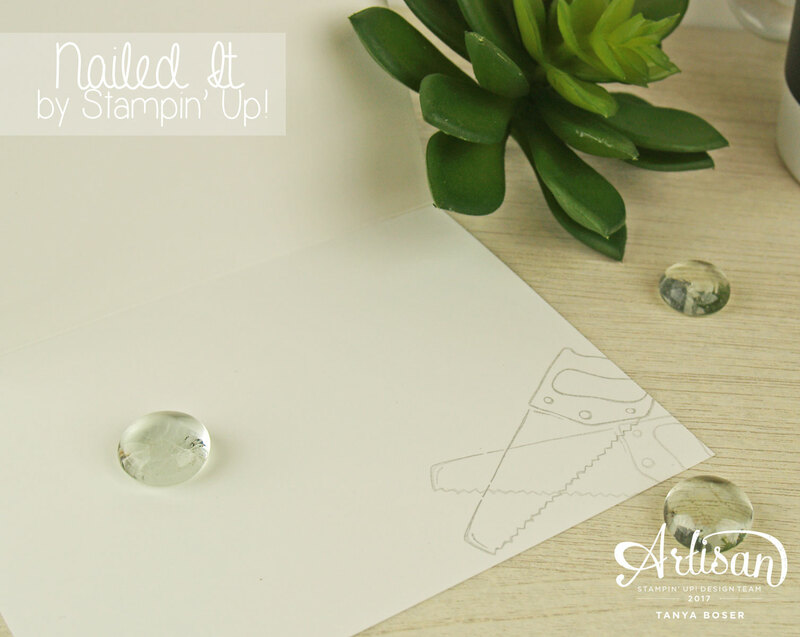 I love the polished look that embossing gives any project. It really is a cost effective wow factor too. 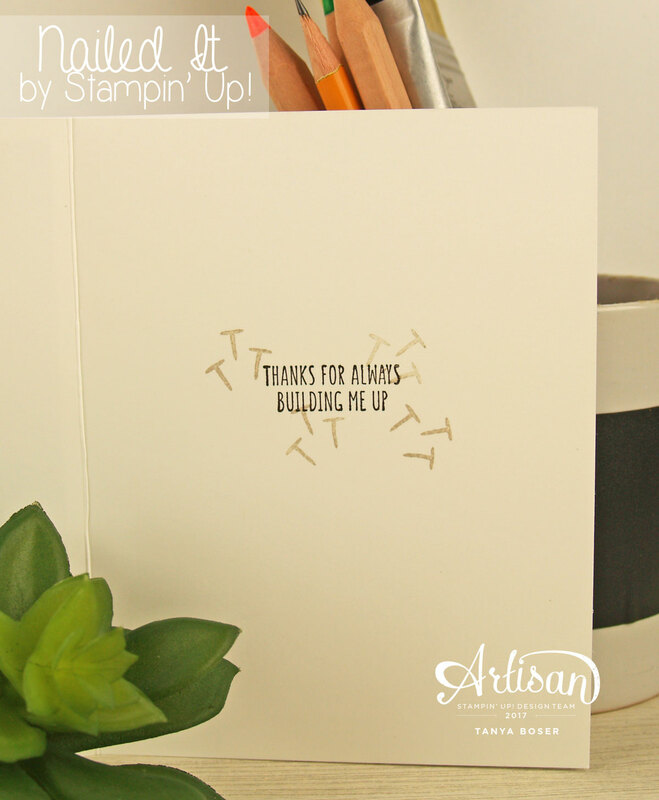 The embossing powder lasts for ever! My second card was an "Oh, shiny" moment. I saw something that made me want to go try a Tempting Turquoise/Pacific Point watercolor background. I was rather liberal with my Pearlized water spray too. It's not too girly, is it? I also used the die in the framelit set the just embosses/debosses. It is subtle, but you can see it run the width of the card behind the saw. Wow, I just realized I did not stitch on either of these cards. There is clearly something wrong with me ;) The spattered effect on this background has a subtle shimmer to it. I tried to catch it here, but it is so subtle! 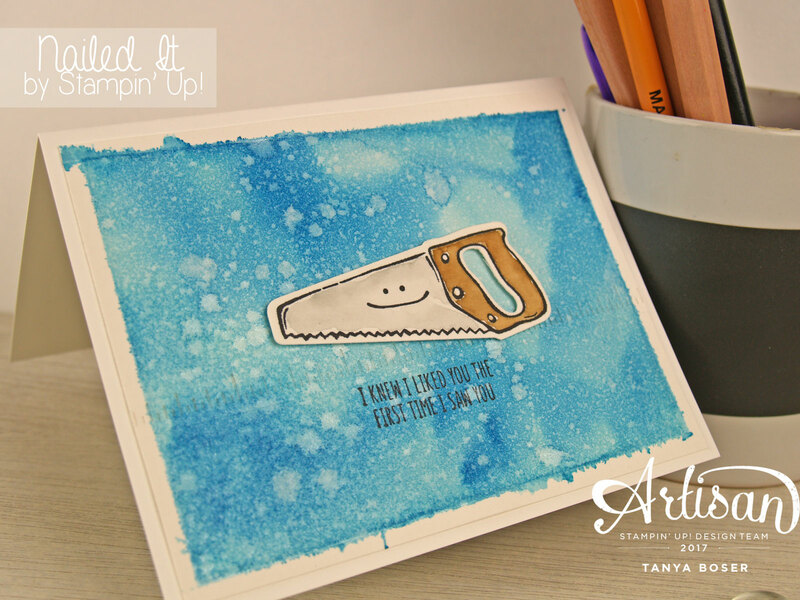 The saw is watercolored with an Aqua-painter and Soft Suede and Smoky Slate. Inside just got a couple of Smoky Slate saws in the corner, and In stamped off once, then stamped twice without reinking. That's all I have for you. 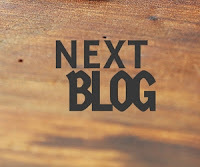 Be sure to come back and see what I do between blog hops. 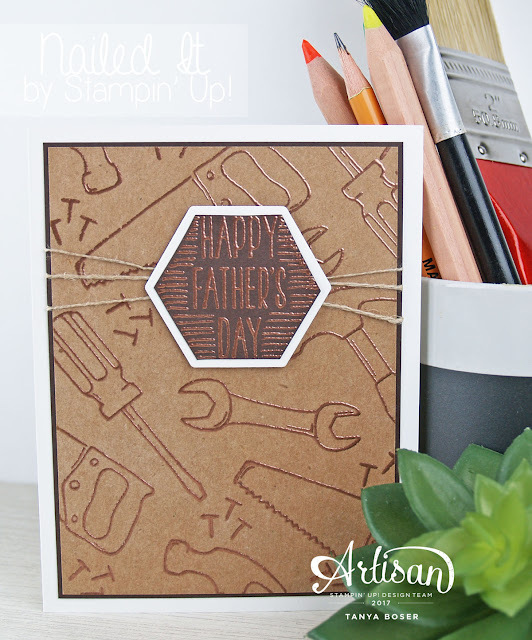 I will be showing lots more Display Stamper stuff, (and a smiley face card with this set!) and some projects that I just haven't had time to write up posts for in the last couple months. Now it is time to go see what Betty Traciak has created, I am sure it will be something totally unique and inspiring!